Value managers. They hold on to the idea that a stock is cheap because of ratios such as P/E, P/S or other nonsensical notion that value can be based solely on fundamentals. But when markets are inclined to discount everything, valuation goes out the window. “Cheap stocks” are cheap for a reason. Simply they do not offer the opportunity for upside in the near term and investors are not going to pay up for the privilege of owning a dog. Of course growth/MOMO stocks will also get slammed in a market correction, but at least looking at a chart or two provides some insight into what the herd is thinking. Whitney Tilson has a fondness for value stocks. JC Penny (JCP) is one of his recent favorites as is Dell (DELL). These names may someday do well, but what is the point of continuing to own positions that are working against you? Maybe it is just me…. Here is a snapshot of the T2 Partners portfolio from their most recent 13F filing. 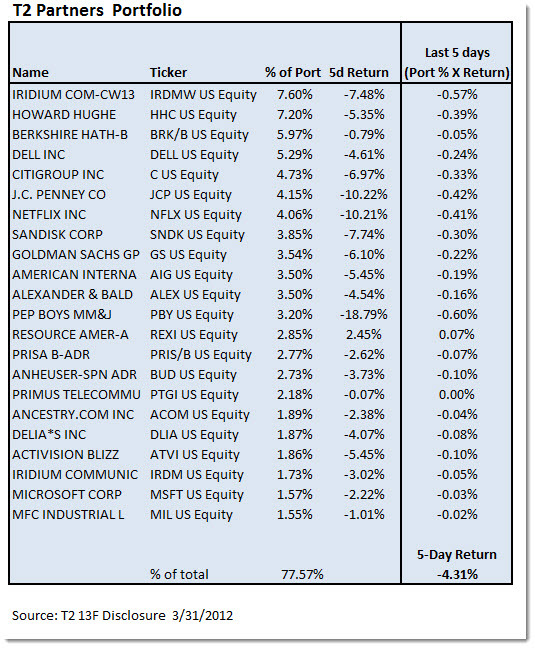 The top positions and their most recent 5-day return is shown as well as the cumulative return for those positions. Note that this is only approximately 3/4 of the total portfolio – but you get the idea.